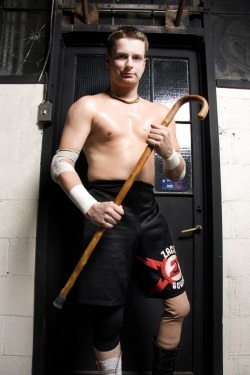 When undersized, one-legged wrestler Zach Gowen was matched up in his hometown of Detroit against future UFC heavyweight champion Brock Lesnar, there was only one way it could go: Gowen was in for one of the most convincing beatings in modern wrestling history. Gowen's left leg was removed when he was eight, as a result of osteogenic sarcoma, a cancer that could have been fatal had it spread. By the summer of 2003 - little over a year after his pro debut - he was in the midst of a short-lived stint in WWE, during which he played a plucky underdog. 'One week I'm bagging groceries and the next week I'm on TV with Vince McMahon, Hulk Hogan and Roddy Piper,' he says. Lesnar, meanwhile, was wholly credible in his role of the huge, unforgiving bully. 'He was like something out of a videogame,' notes Gowen. Before the bell rang to signify the start of the contest, Lesnar casually left the ring to taunt Gowen's mother, who was sitting in the front row. A hopping mad Gowen took the opportunity to vault over the top rope on to a distracted Lesnar, which - in an inspired move - he followed by clubbing him with the prosthetic leg that he had removed prior to the match. It was the last offence the 20-year-old would have all night. Lesnar was soon disqualified when he clouted the one-legged wonder in the head with a folding chair but the onslaught continued as he flung Gowen - who was, by now, bleeding extravagantly - leg-first into the ring post. Twice. As a finishing touch, Lesnar tipped Gowen off the stretcher that he was being wheeled away on.